At a press conference in New York earlier today, Google launched a number of new Pixel devices, probably the most important of which will be the refreshed smartphones. 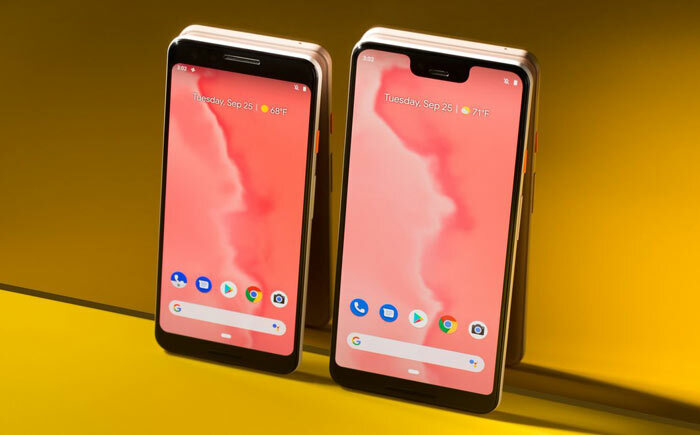 The designs and features of the new Google Pixel 3 and 3XL were widely leaked during the weeks, days and even hours ahead of today’s event so hold little surprise to those who watch smartphone developments closely. However, it is good to get definitive details, availability and pricing direct from the horse’s mouth. In its presentation Google went large on the cameras in these new generation Pixel smartphones but there were some interesting ‘AI-powered sidekick’ features highlighted too. There is also the new Pixel Stand which wirelessly charges your mobile provides one touch shortcuts and provides ‘Hey Google’ access to Google Assistant. For photography on the go, a good smartphone camera is a great asset as it is a device that tends to be carried round everywhere. With the Pixel 3 and 3XL, Google boldly claims that the “best camera gets even better”. Round the back of both devices the main camera is still a single lens model. Google employs a 12.2MP main camera with 1.4μm sized pixels, OIS and EIS, autofocus and dual pixel phase detection, spectral and flicker sensors and an f/1.8 aperture. For selfie purposes there are dual cameras up front with 8MP wide and normal FOVs. In addition to the above Google hopes its offer of free, unlimited photo and video storage in original resolution on Google Photos will be an attraction (unlimited storage plan until 31st January 2022). More AI features are built in for your convenience. Continuing from our camera discussion above, Google Lens is built in and will allow users to scan and translate text (URLs, QR codes, email addresses etc), find similar styles of clothing, or identify popular plants and animals. Simply long-press in the Pixel camera to bring up this functionality. In Gmail, a smart compose feature suggests phrases in your emails so that you can draft them faster, Gboard recommends stickers and more. Google Assistant is baked into the Pixel 3 devices and can help you find answers and control your phone and smart home devices via your voice. Summon up the Assistant with a squeeze or by voice. If you have to routinely deal with unwanted or spam calls you might be pleased to be able to hand off potentially time wasting calls to Google Assistant. Thanks to the ‘Screen Call’ function you can let Google take the call and find out who and why a number outside of your phonebook is calling, as well as other info you might be interested in. Google will provide an immediate transcript of the call and let you decide to pick up or respond by tapping a quick reply such as “I’ll call you back later”. In the US calling AI takes a greater step with Google Assistant being able to complete real-world tasks like booking a table at a restaurant. As you can see above, the Pixel 3 phones have a lot in common, even (surprisingly) the battery capacity. The looks are rather different though, and it is clear that the Pixel 3 XL’s particularly deep notch will turn some people off. I’ve already received two emails from UK mobile phone companies offering pre-order and contract deals with the Pixel 3/XL. Are any HEXUS readers interested in these new generation Google Pixel smartphones? 5 Does the Samsung Galaxy Fold hinge and screen lack durability? My £380 LG G7 has arguably better hardware features, probably has around 90% of the user experience and yet only cost 50% of the price of Pixel. Plus when Treble or Lineage roms become widely available will have a software experience almost on a par with it. At £739 for the base model they're putting themselves on a par with Apple but don't have the brand recognition, desirability or customer support to back it up. This will be another year of low sales volumes for Pixel devices me thinks, better of getting one 6 months when prices have come down or there are cheaper 2nd hand ones available.